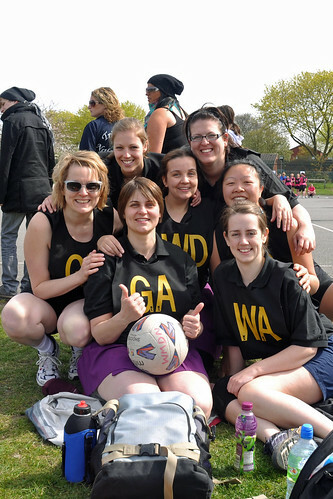 About 6 years ago, I joined West Midlands Deaf Netball team. Within a year, I was Secretary. We were a bunch of mostly Deaf girls, with a few hearing girls with connections to the Deaf community playing netball in a tournament, having fun. We had to fold about 3 years ago as four of the most regular members of the team (myself included!!) got pregnant around the same time and couldn’t play or commit the time to the committee. It was a huge shame, but as it’s very hard to find enough Deaf girls in one area, who are committed and interested to keep playing every week, we weren’t able to continue and closed the team down for a while. However today, we had a reunion at our old stomping ground in Stockland Green, Birmingham for a mini-tournament. Considering most of us were the most unfit we’d been, and two of the team were sporting previous injuries I think we did really well! OK, we didn’t win a single game… but we really didn’t care. We were there for the fun of it but we’ll be back in July to do better! We rock, as a team, a bunch of friends and although we had lost a lot of our knack netball skills wise, by the fourth game we were slipping right back into it! So here we are. Thanks girls, for a ruddy marvellous day. Miss you, and look forward to playing with you again in July with hopefully some more of the extended old crowd! One Response for "West Midlands Deaf Netball ROCK"